This giant sea-monster was plucked out of the Pacific Ocean and now resides in Britain. 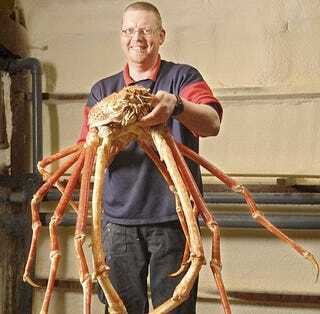 With legs long enough to straddle a car, this Japanese Spider Crab is truly a giant sea beast worthy of a Jules Verne novel. The massive arthropod is 10 feet from claw to claw, and is still growing. The creature can live up to 100 years, though no one is certain how old this crab is. Its body is the size of a basketball.